Emotional intelligence is important for work at all levels. 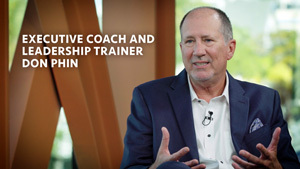 Don Phin helps executives expand, grow and adjust their careers. His lessons about coaxing, encouraging and inspiring apply to anyone in the workplace. Phin, an Executive Coach and Leadership Trainer, has been a California employment practices attorney since 1983. He litigated employment and business cases for 17 years and quit once he figured out that nobody wins a lawsuit. He now coaches executives and investigates challenging workplace problems.